This week for Tuesdays with Dorie, Dharmagirl of bliss: towards a delicious life chose Tarte Noire on page 351. What, you ask, is a tarte noir? It is a rich chocolate ganache poured into a tart shell and served with a diet book. Ganache, made of chocolate and cream, is the luscious concoction used to make chocolate truffles. I was looking forward to making this, but when the time came, I had a rare, irrepressible urge to eat cake. Now, I may get that urge once a year; unlike my spouse, Master Chow, I am not a fan of cake. So, I decided to make ganache, and put it on a cake. A luscious, moist, decadent cake. I turned to one of my favorite blogs, Smitten Kitchen, for a recipe that I had bookmarked a while ago. The result? Extraordinary. Truly, truly extraordinary. It puts all other chocolate layer cakes to shame, although the Chocolate Stout cake is definitely in the same league. Here is what I did and some advice, as well. Instead of two, 10-inch pans, I used three, 8-inch pans to end up with a three layer cake. The ganache was so rich, however, that I don’t think I will do that again; two layers is plenty, and if I make three layers, I’m going to use a jam or a chocolate pudding or mousse to fill some of the layers. Instead of buttermilk, I used low fat kefir (a liquid yogurt), and that worked really well. Use top quality chocolate. Trust me. I used a combination of Valrhona, Callebaut, and some bits of Guittard that I had laying about. You MUST freeze the layers before you frost them. The cake is so tender that if you try to frost it with unfrozen cake layers, they WILL fall apart, so plan ahead. Just double wrap the layers in plastic wrap and pop them into your freezer until they are good and hard. They will that while you are frosting the cake. This cake, with the aforementioned modifications is on the repeat list. It was amazing, and one of the few chocolate cakes that I’ve ever had that did not disappoint. Recipe below the jump, but be sure to visit Dharmagirl for the Tarte Noir recipe, and the TWD blogroll to see what others made! 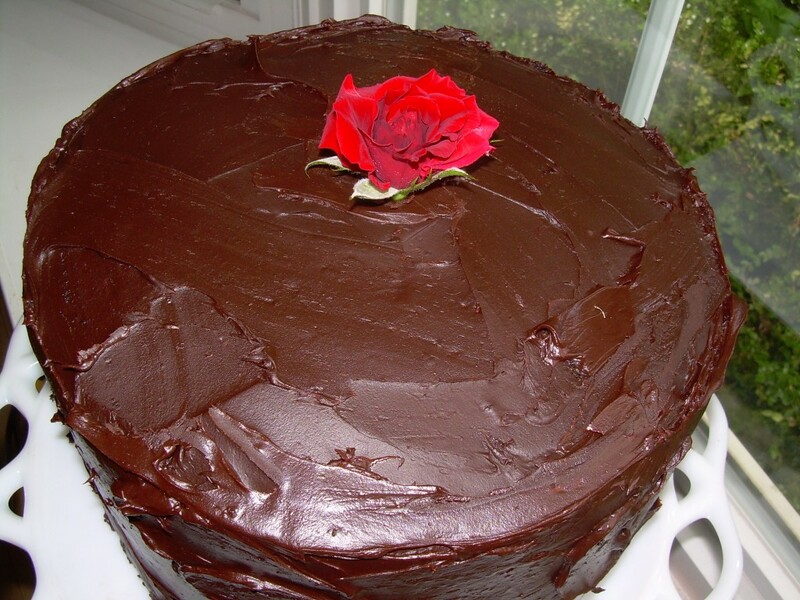 The recipe below is for 2 10-inch layers or 3 8-inch layers coated in chocolate ganache. If you make three layers and you want chocolate ganache between each layer, you will have to multiply the ganache recipe by 1.5. Special equipment: two 10- by 2-inch round cake pans or three 8- by 2-inch round cake pans. Make cake layers: Preheat oven to 300°F. and grease pans. Line bottoms with rounds of wax paper and grease paper. Into a large bowl sift together sugar, flour, cocoa powder, baking soda, baking powder, and salt. In another large bowl with an electric mixer beat eggs until thickened slightly and lemon colored (about 3 minutes with a standing mixer or 5 minutes with a hand-held mixer). Slowly add oil, buttermilk, vanilla, and melted chocolate mixture to eggs, beating until combined well. Add sugar mixture and beat on medium speed until just combined well. Divide batter between pans and bake in middle of oven until a tester inserted in center comes out clean, 1 hour to 1 hour and 10 minutes. These are just guidelines! Cooking time will vary based on the size and number of cake pans that you use, so keep a close eye on your oven. Cool layers completely in pans on racks. Run a thin knife around edges of pans and invert layers onto racks. Carefully remove wax paper and cool layers completely. Double wrap each layer in plastic wrap and freeze. When you frost the cake, the layers MUST be frozen solid. Make frosting: Finely chop chocolate. In a 1 1/2- to 2-quart saucepan bring cream, sugar, and corn syrup to a boil over moderately low heat, whisking until sugar is dissolved. Remove pan from heat and add chocolate, whisking until chocolate is melted. Cut butter into pieces and add to frosting, whisking until smooth. Transfer frosting to a bowl and cool, stirring occasionally, until spreadable (depending on chocolate used, it may be necessary to chill frosting to spreadable consistency). Stirring this over a bowl of ice water cools it off quickly and evenly. Spread frosting between cake layers and over top and sides. Cake keeps, covered and chilled, 3 days. Bring cake to room temperature before serving. Whoa…. now THAT’S a cake! How wonderful – I’m sure it’s just as rich and decadent as the tart – it’s a beaut! Hi Mdm Chow, your this cake looks sinfully delicious….and looking at the well taken pic, I’m sure it just melts in the mouth…. and the pure ecstasy of that chocolate making the mouth hum, ‘hmmmmmm’ and eyes rolliong upwards. Outstanding! Can see you have a Black Belt in baking. Have fun and keep a song in your heart, best regards, Lee. Good call! I’m with you, ganache goes much better with cake. Beautiful cake! The ganache would be good on anything. Nice job. Sure glad I read this. I was fixing to made chocolate ganache to spread on 3 layers but sounds like that may be too much. Rethinking my plan. Too rich?? Is there such a thing? I’m with Master Chow. I can eat cake all of the time. Chocolate!!! Yes!! My favorite! Chocolate cake is my all time favorite…can I have a piece, please? 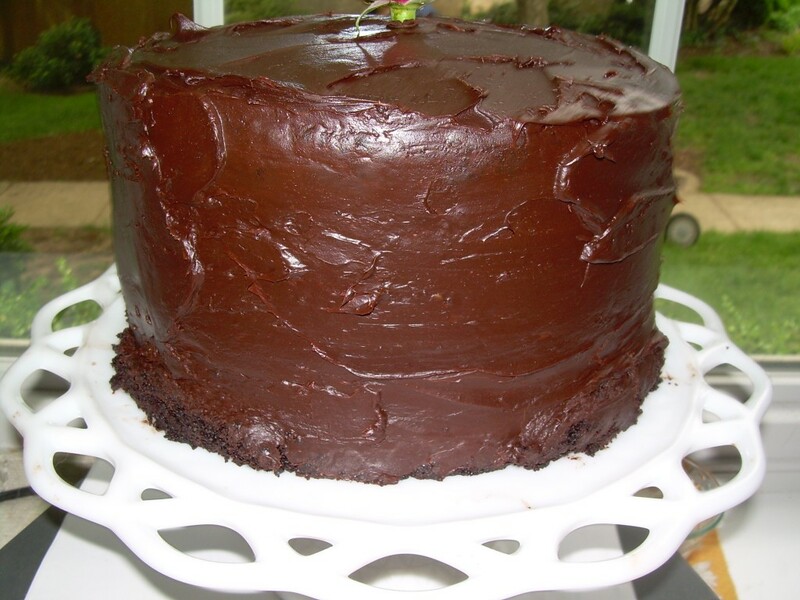 Great tip about putting the wax paper strips under the foil base…ganache seems to require the strips and that cake seems to be delicate, just what a chocolate cake should be. So beautiful with the rose, too! HA! Thank you for stopping by! Yes, it was very rich; I froze the leftovers and we sliced them very thin and ate them in their still frozen state. Delicious!